Make your boutique tissue box cover or tissue box holder special with your very own monogram. Pop a tissue box cover personalized over your tissue box and voila you have a chic little decorative accessory for a bathroom, bedroom or desk. 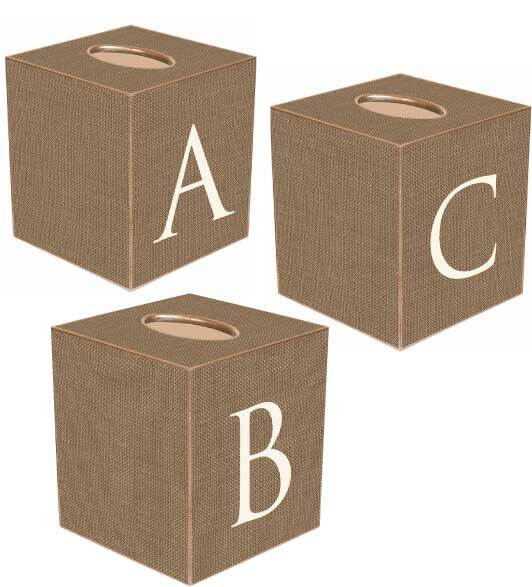 Pick your color and your letter for your tissue box cover personalized. 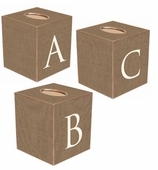 Available in beige with a gold accent trim or gray with a silver accent trim. Tissue box covers are great monogrammed gifts for women or men. We call them bespoke or beautiful. Customized, personalized gifts made to order in the USA. Matching wastebaskets also available. Make a bathroom accessory set.